Your Friday just got a whole lot better. With Madonna on cowbell and Fallon on the wood block, the singer kicked them off with a whistle blow. 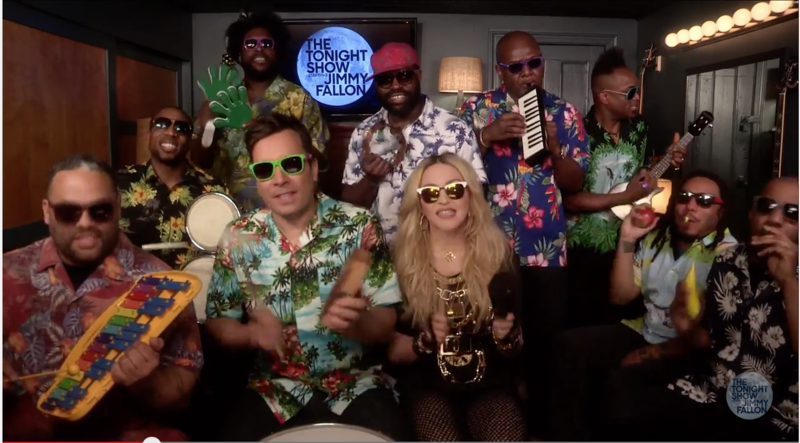 After listening to Madonna, Jimmy Fallon and The Roots play one of our favorite get-off-your-booty-and-dance songs with xylophones and banana shakers, there is no way you could have a bad day! Or stop singing it! But Madonna’s appearance on The Tonight Show didn’t quite hit all the high notes. A few fell seriously flat when Fallon tired to get the singer to fulfill her dream of becoming a stand-up comedian. Madonna get’s up and the first thing we notice is her lack of pants. Why is she not wearing any pants!? But I digress. When she actually starts telling some of her “jokes” its just weird and slightly uncomfortable… for everyone. The strange way she just keeps talking about dating younger men… maybe I just don’t get it but I just don’t get it. You can see Fallon behind her fulfilling his role and dutifully laughing animatedly. Did I mention how she’s not wearing any pants? The entire thing is just hard to watch. Sorry Madonna, we’re just not feeling your stand-up.